The fourth of July commemorates the adoption of the Declaration of Independence in the United States. The fourth of July bash started in 1912 in Denmark. In 1998, Congress passed a bill declaring 21 days between Independence Day and Flag Day to be named Honor America Days. The following collection of catchy 4th of July slogans have been displayed and used by others, but can be incorporated with your next festive event. Independence day is here,come on let’s see our flag rise high. Lets light up the sky this Independence Day. Liberty is the breathe of life to nations. May your Independence Day be filled with love and happiness I pray. No matter the weather, lets celebrate Independence Day together. Remember the reason why we celebrate Independence Day. A total of 56 members signed the Declaration of Independence with Benjamin Franklin being the oldest of all at age 70. Edward Rutledge was the youngest at only the age of 26. 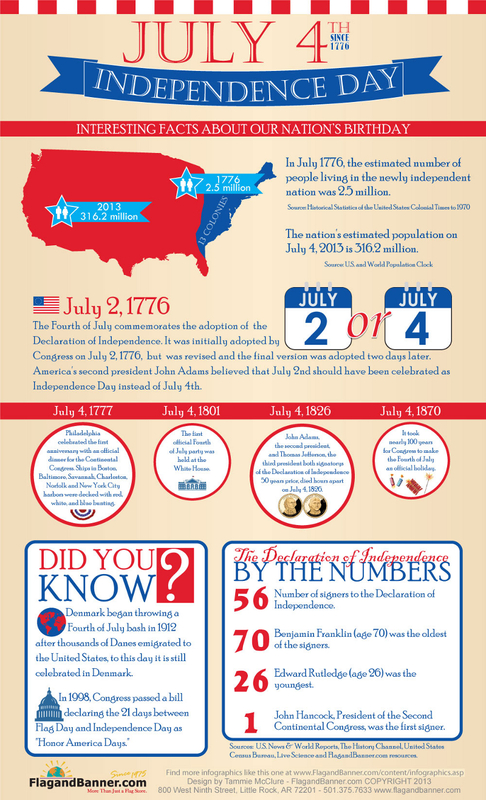 The following infographic outlines interest facts about the United State’s birthday.